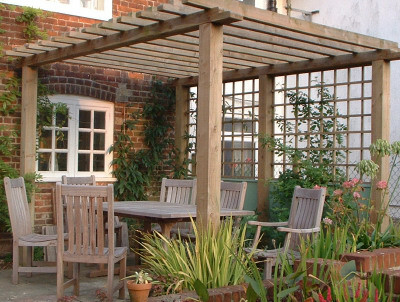 This arbour makes for a pleasant dining area during the spring and summer months. Ideal for those wanting to make the most of their outdoor space. The arbors that we supply and build are custom made and in terms of strength and durability are in a different league to the majority of 'off the shelf kits'. We supply this product in softwood or hardwood, both good for 20 years plus.